CWA members at Frontier Communications in West Virginia and Ashburn, Va., have been out on strike since March 4, and the workers are standing strong in their fight to keep good jobs in their communities. The Charleston Gazette-Mail featured an op-ed by Frontier worker Elisha Edgell of Princeton, W. Va. "We have 1,400 people out on these streets on strike because they want to work here, they want to be here, and they want to continue to be your neighbors and friends in your community," Edgell wrote. An ad running on radio stations across West Virginia and shared by workers on Facebook explains how Frontier's failure to maintain and update its network and its job cuts are holding back progress in the state. Frontier workers at many other locations across the country held informational picketing to show their support for the West Virginia and Virginia workers on strike, and to show the company that all CWA Frontier workers are ready to stand together to protect jobs. Frontier workers across the country are standing strong in their fight to keep good jobs in their communities. Passenger service agents took action on March 19 at the Charlotte Douglas International Airport to demand respect, fairness, and an end to poverty wages at Piedmont Airlines, a subsidiary of American Airlines. More than 120 people turned out including Piedmont gate agents from Boston, Phoenix, Huntsville, San Antonio, Richmond, and Charlotte. Piedmont agents have been bargaining for a new contract since February 2017. Despite American Airlines posting a $1.9 billion profit in 2017, many Piedmont agents are paid wages so low that they're forced to rely on food stamps and other forms of public assistance. CWA and the company recently requested that the National Mediation Board oversee negotiations. Passenger service agents are demanding respect, fairness, and an end to poverty wages at Piedmont Airlines. Check out more photos on the Piedmont Agents Facebook page. Negotiations between CWA District 4 and AT&T Midwest are continuing. Read the latest bargaining reports here. CWA members from Local 4900 in Kokomo, Ind., are mobilizing for a fair contract at AT&T Midwest. Negotiations between CWA Legacy T and AT&T are continuing. Read the latest bargaining reports here. 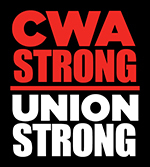 CWA has opened negotiations with the State of New Jersey for more than 32,000 state employees. CWA members and Governor Murphy's administration are currently bargaining to resolve legal, contractual, and retroactive matters back to the July 2015 expiration of the New Jersey State Executive Branch contract. At stake are across-the-board wage increases and restoring withheld salary increments — annual raises state workers receive when they reach an annual milestone in state service. Former Governor Christie illegally withheld state workers their pay increments after contract expiration, a move that CWA legally challenged. Demands to gut respect and dignity language, due process protections, overtime and leave rights, layoff and job security rights, and other rollbacks Christie wanted were rejected by the CWA bargaining committee last year. CWA recognizes and appreciates the patience and solidarity of our members as the bargaining committee works diligently to reach an agreement. New Jersey executive branch members can get the latest bargaining updates here. Three weeks after workers announced their intention to form a union, Mic Media agreed to voluntarily recognize the NewsGuild of New York/CWA Local 31003 as the collective bargaining representative for about 50 editorial staff members at the online media company. 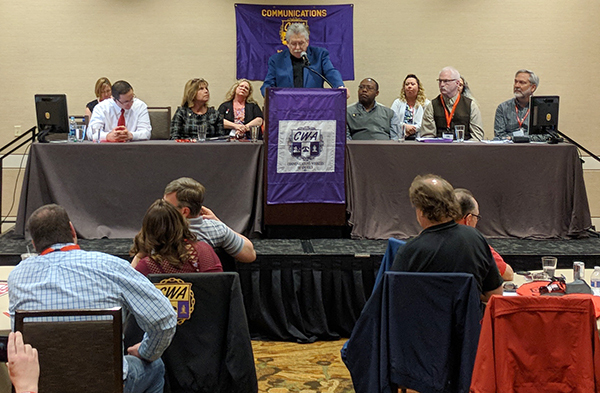 "We are thrilled to have secured voluntary recognition of our union and are eager to get to the bargaining table," the staff said in a statement. "We look forward to working collectively toward a contract that ensures Mic is a workplace that includes and protects all of our workers." Staff members at Revolution Messaging, a digital media firm known for their work on Bernie Sanders' presidential campaign and other progressive initiatives, announced that they are forming a union with Washington-Baltimore Newsguild/CWA Local 32035. Management immediately agreed to voluntarily recognize the union. CWA Local 3181 represents more than 2,000 public workers in Florida. The Florida state legislature has been targeting unions by passing legislation this year to decertify education units that have below 50% membership. CWA Local 3181 is rising to the challenge, signing up about 250 new members through their "Unbreakable" campaign over the past 11 months. Thanks to these efforts, a majority of represented workers are now CWA members in Palm Beach County, the Village of Tequesta, and St. Lucie County School District. But CWA Local 3118 isn't resting just because units affected by this anti-union legislation are out of imminent danger. 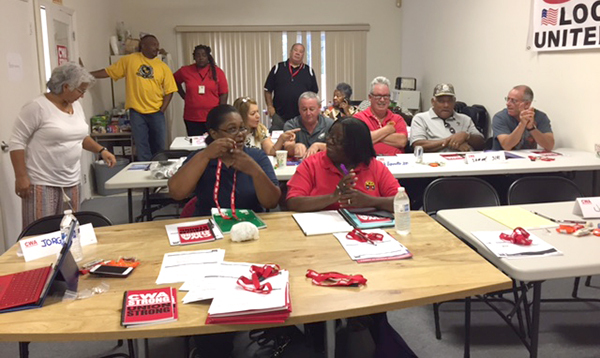 They are continuing to organize, sign up new members, and recruit new stewards and activists to make CWA STRONG. CWA Local 3181 members are organizing, signing up new members, and recruiting stewards and activists to make CWA STRONG. 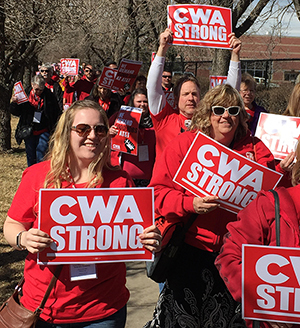 CWAers gathered in Denver, Colo., for the annual CWA District 7 conference. CWA President Chris Shelton and District 7 Vice President Brenda Roberts spoke to the members about how the labor movement can mobilize to make CWA STRONG. "In the face of these attacks on labor, it is our challenge and responsibility to make CWA STRONG," Shelton said. CWAers gathered in Denver, Colo., for the annual CWA District 7 conference. The conference attendees held a rally outside of an AT&T office in Denver on Tuesday to call on AT&T to put a stop to their offshoring practices, and to show their support for CWA members across the country at Legacy T who are now bargaining with AT&T, and CWA members in District 4 who are bargaining with AT&T Midwest. AT&T CEO Randall Stephenson was one of the biggest supporters of the Republican corporate tax cut bill and promised to create thousands of good jobs in the U.S. if it passed. CWA members are calling on AT&T to live up to Stephenson's promises and negotiate fair contracts that protect good middle class jobs. 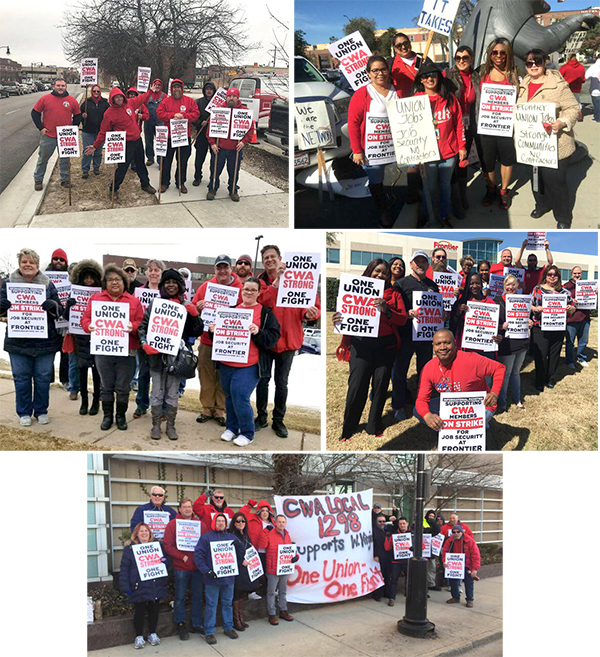 D7 conference attendees held a rally outside of an AT&T office in Denver on Tuesday to call on AT&T to put a stop to their offshoring practices and to show their support for CWA members bargaining at Legacy T and AT&T Midwest. CWA-backed legislation that puts pressure on corporations to stop sending call center jobs overseas continues to gain momentum. The Vindicator in Youngstown, Ohio published an editorial calling for lawmakers to support CWA-backed legislation at the state and federal level to protect call center jobs, saying, "The time is right to move these worthy initiatives off the legislative back burner and into the home stretch toward bipartisan passage." Ohio U.S. Senator Sherrod Brown is a cosponsor of the United States Call Center Worker and Consumer Protection Act, which would make U.S. companies that offshore their call center jobs ineligible for certain taxpayer funded grants and loans. The bill would give U.S. consumers a right to know where they are calling and to be transferred to a U.S.-based location, and create a public list of companies that offshore call center jobs. Ohio lawmakers are working on a similar state bill. State Senator Joe Schiavoni, along with State Reps. John Boccieri and Michele Lepore-Hagan have introduced legislation that would deny state aid or grants to call centers that export their jobs out of Ohio. This legislation is especially important in light of the recently passed Republican corporate tax cut bill which gives companies even more incentives to send jobs overseas. CWA, along with 1,000 labor, environmental, family farm, consumer, civil rights, faith, small business, public health, and other civil society organizations, sent a letter to Congress laying out criteria for renegotiating the North American Free Trade Agreement (NAFTA). Pointing to the loss of more than 930,000 American jobs and falling wages under NAFTA, the letter calls for a new agreement that puts workers first. "President Trump and the Republican Congress have not lived up to their promises to bring good jobs back to the United States," said CWA President Chris Shelton. "In fact, with the new tax law that provides incentives for corporations to send jobs overseas, they have done the opposite. It's time to get serious about fixing our broken trade system and bringing jobs home by committing to a total rewrite of NAFTA." "The new agreement must put a priority on raising wages and standards for all jobs, including call center and information technology jobs, so that American workers can compete on a level playing field. And it must remove the corrupt ISDS system that provides special protections for multinational corporations while leaving working people with no way to fight back when these same companies destroy their communities," Shelton said. Last week, a judge ruled that a sexual harassment case brought by former T-Mobile worker Angela Agganis of Waterford, Maine, can proceed to trial in a federal court. Agganis' case was highlighted in 2015 by T-Mobile Workers United, a CWA-backed organization of T-Mobile employees joining together for a voice and fair treatment at T-Mobile. "No working woman should have to endure sexual harassment on the job," Agganis said. "And no woman should be denied the right to speak to others about what occurred. I hope this suit will ensure that women working at T-Mobile are treated with the dignity and respect they deserve and encourage women everywhere to come forward and put an end to intolerable working conditions." Washington, D.C. Mayor Muriel Bowser has signed the Fair Elections Act into law. The bill puts democracy back in the hands of everyday voters by matching $5 for every $1 contributed to candidates who agree to only accept small contributions. The bill will help make sure D.C. elected officials are accountable to working people – not mega-donors and corporations. CWA members have been leading the fight for small donor public financing programs across the country because they amplify the voices of working people. Enjoy making videos? Know someone who does? 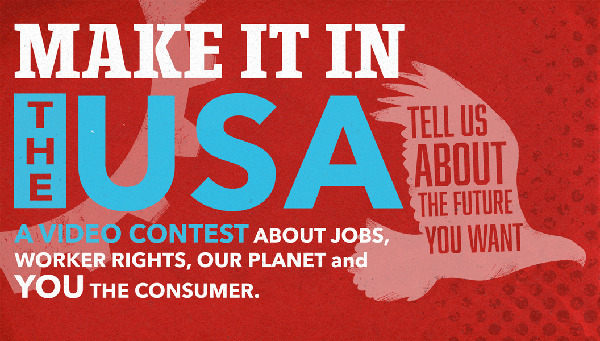 Consider creating something for the "Make it in the USA" Video Contest. Contest organizers from the UAW's BuildBuyUSA campaign are looking for videos that get Americans thinking about the value of buying goods manufactured in their communities. $5,000 prizes will be given to the winning entries in each of four categories: song; non-song; union-member; people's choice. The submission period runs through April 25 and the winning videos will be announced on June 1. Learn more and enter the contest here.